As a student-athlete, Rebecca Nunge, a senior outside hitter on the University of Notre Dame volleyball team, has spent most of her summers on campus — taking classes and training with teammates. But it was only recently that the two-time monogram winner really ventured off campus to engage with the community in a meaningful way. After a successful junior season on the volleyball court — 26 starts and a career-high 105 blocks and 276 kills — Nunge, a science preprofessional studies (pre-med) major with a minor in peace studies, spent the summer working on HIV/STD and substance abuse prevention and education and juvenile justice reform in South Bend. As part the new Summer Community Health Innovation Program (SCHIP) at Indiana University School of Medicine-South Bend (IUSM-SB), the Evansville native, who is leaning toward a career in medicine, interned with Imani Unidad, a South Bend-based charitable organization, for several weeks in June and July. There, Nunge helped facilitate group counseling sessions and restorative justice circles and — in collaboration with the St. Joseph County Juvenile Justice Center — lay the groundwork for a proposed youth court in St. Joseph County. With respect to the youth court, Nunge contributed research to the project and helped to rally support for the court among key stakeholders, including the Boys and Girls Clubs of St. Joseph County, the Notre Dame Robinson Community Learning Center and Transformation Ministries, a Christian-based nonprofit that invests in youth and families in South Bend. Designed as a diversion program for juvenile offenders who are thought to be a low risk to reoffend based on past behavior, family and school history and other relevant factors, the court would be the first of its kind in St. Joseph County. 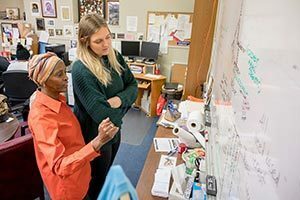 Long fascinated by science, Nunge became interested in issues of health and justice in 2016, when she traveled to Israel for Notre Dame’s Jerusalem Global Gateway summer program. The three-week program exposes students to the depth and complexity of life in Jerusalem, a city of some 900,000 residents, as a site of religious, historical and political significance. There, Nunge observed how poor access to health care in parts of the West Bank, a disputed territory on the border with Jordan that includes East Jerusalem, negatively affected the lives of Palestinian refugees in those areas. “I had a few weeks to reflect on the trip, and I realized that medicine was going to be the path that I hoped to take to influence the lives of others, reduce suffering and improve the human condition,” Nunge said. Supported financially by the Leighton Foundation, SCHIP is an eight-week program that engages IUSM-SB medical students and undergraduate and graduate students from other colleges and universities in community-based learning with organizations focused on health-related social needs. IUSM-SB worked with the Center for Social Concerns at Notre Dame to identify such organizations, relying on the center’s years of experience in the area of community-engaged education and research and its long list of existing partners in the South Bend area. The new program featured 19 students from seven campuses — Saint Mary’s College, Indiana University South Bend, Indiana University Bloomington, Goshen College and Ball State University, in addition to Notre Dame and IUSM-SB. More than 60 students applied for the program. Aside from the internship, which was paid, the program included a classroom component where students participated in didactic discussions about the program and learned about the social determinants of health, and an innovation component where they worked to identify and address critical health-related needs in the community. In terms of community partners, the focus was on programs “that (didn’t) look like medicine,” such as safe and affordable housing programs, food programs and health and recreation programs that provide access to quality greenspace, according to Joe Kotva, an adjunct professor at IUSM-SB and co-director of SCHIP. “If you’re concerned about individual and community health, you have to put your time and energy into places that don’t look like typical doctors’ offices,” said Kotva, a former pastor and an author whose book, “On Moral Medicine: Theological Perspectives on Medical Ethics,” remains the definitive anthology for Christian theological reflection on medical ethics. Senior Rebecca Nunge, right, visits with Debra Stanley, founder of the nonprofit Imani Unidad. Photo by Matt Cashore/University of Notre Dame. Housed in the Colfax Cultural Center, a historic former school building on South Bend’s near west side, Imani Unidad easily fits that description. Founded in the early 2000s, the organization offers comprehensive risk counseling services for individuals living with HIV, challenged by substance abuse or burdened by detrimental interactions with the criminal justice system. The organization also provides community-level education and training with a focus on HIV/STD and substance abuse prevention and education. “We create a safe space for those we serve to deal with their personal hurts and personal pains,” said Debra Stanley, founder and manager of Imani Unidad. In doing so, the organization focuses on restorative justice, a form of justice that emphasizes rehabilitation through reconciliation with victims and the community as a whole, but also personal reconciliation. That approach, along with Stanley’s reputation as a trusted voice in the community on issues of health and justice, persuaded Cynthia Nelson, executive director of the JJC, to partner with Imani Unidad on the project. “Knowing Debra Stanley, her group felt like the perfect fit because of her work with peer-to-peer counseling, her work with restorative justice … (and) her long history of working with youth in the community,” Nelson said. Ultimately, Imani Unidad would manage the court, Nelson said, based on evidence of better outcomes for community-run youth courts compared with government-run courts. So, what is youth court? Generally speaking, youth court is a problem-solving court that serves as an alternative to the juvenile justice system, with young people, including those with past contacts with the criminal justice system, assuming one or more of the traditional courtroom roles, from prosecutor and defense attorney to juror and even judge. Adjudication is is peer-driven, with a focus on restorative/reconciliation processes. Examples include service learning, tutoring, counseling, drug testing, peer mediation, restitution, knowledge- and skills-based activities, peer-to-peer group support and/or oral or written apologies. Young people who successfully complete the program avoid a criminal record. But the benefits don’t end there. Youth courts also cost less to administer than traditional juvenile courts, Nelson said. They help educate non-criminal youth about the justice system. And they impose fewer costs on respondents and their families in terms of lawyer’s fees and other court-related fees and fines. Here, a jury composed of student volunteers and ex-offenders would work with police, prosecutors, judges and other court officials and community partners to adjudicate cases involving young people accused of low-level offenses such as theft, vandalism or underage drinking. The cases would be heard in a non-courtroom setting, outside of the JJC, so as not to confuse the process with a criminal proceeding, Nelson said. “We want to prevent the criminalization of children and provide services to (young people) to address those issues” that lead to criminal behavior, Stanley said of the purpose of the court — issues such as poor mental or emotional health, food insecurity or a lack of parental supervision at home. Stanley, who also worked for AIDS Ministries for 11 years, recalled a recent visit to a youth court in southern Indiana, where a young person with no food at home was awaiting trial for stealing food. “Why are we criminalizing that?” she said. Nunge was among three SCHIP interns assigned to Imani Unidad. The other two, also women, were from Notre Dame and Saint Mary’s. The Notre Dame student, Jocelyn Keranen, is a recent graduate of the master’s in global health program at the Eck Institute for Global Health. For Nunge, the experience reinforced her belief in the healing power of justice, and deepened her connection to and affection for the South Bend community. Originally published by Erin Blasko at news.nd.edu on November 26, 2018.